Happy 1st Anniversary In Publishing! 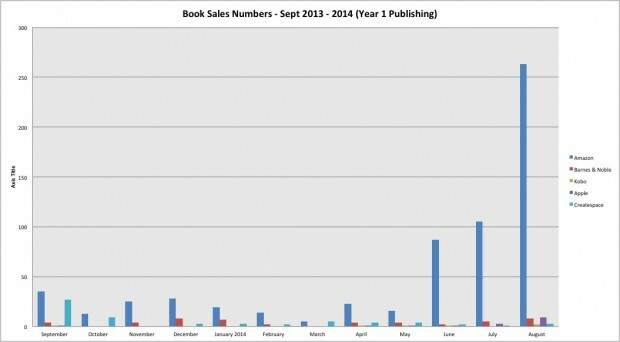 This is part one of two posts on my first year in publishing. Part two can be found here. Get out the balloons, cupcakes, and noise makers! I have been a published author for one year now. Kinda crazy to think about it, right? This has been an amazing, mind-bending, anxiety-ridden, fulfilling year. I’ve met the most amazing people, and I’ve seen some of the most mind-boggling things in my business. It has been one hell of a year. I now have three books in my series out (REMOVED, RELEASED, and REUNITED), and FACE TIME, plus a few short stories in my REVEALED series, all in one year. It’s no joke to say that I’m exhausted and wondering how long I can keep this output up. The real truth of the matter is I can’t. My second year in publishing will still be productive but with less output and more community efforts. I’m now a board member at NA Alley, and we have a full year planned there, bringing New Adult fiction to forefront and championing it as a broader category than just a romance genre. Talk of another publishing opportunity came my way just yesterday. I will definitely be busy. What’s on my plate? 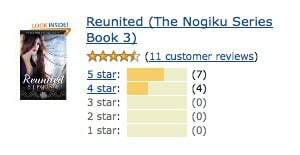 I am writing Book 4 of the Nogiku Series. I have the idea for a new contemporary romance series I hope to start writing before the end of 2014. I plan to tackle the next Love in the Digital Age book during NaNoWriMo. 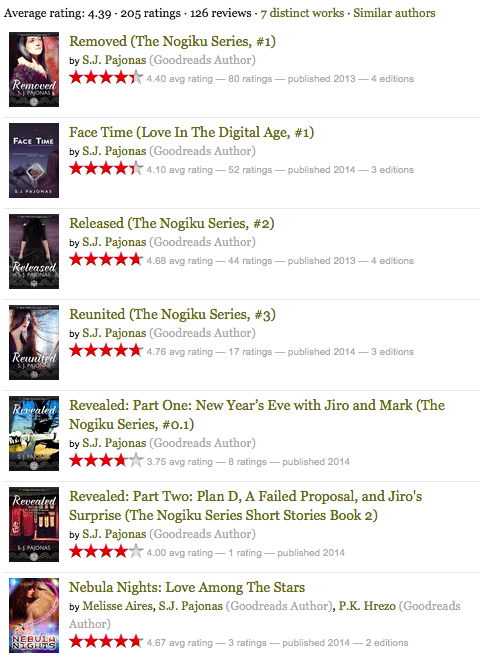 And I have been brainstorming ideas for a companion series to the Nogiku Series. Plus I want to write a Mark Sakai prequel (I already have a title for this one!) There really in no end to my writing in sight, which is a good thing. I often wondered if I would have ideas for something outside of the Nogiku Series, and this year has proven to me that this is only the beginning. Here’s a question most authors dislike, “Are you making enough money to consider it a career?” That is an answer I will probably answer with a plain “no” for many years to come. 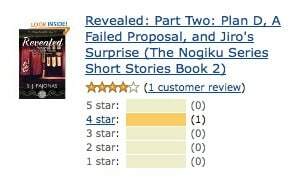 I write science fiction romance and it’s Japan-based too. I don’t have a huge audience like my contemporary romance friends, but let me say, I appreciate every single one of my readers. Every. Single. One. Even if they didn’t like my writing. They gave it a chance, and for that I’m grateful. I’m not going to go into too much detail on how I’ve done over the past year but here’s a good graph of numbers. As you can see, I did not have much in the way of sales until recently. That’s a whole year of looking at low numbers and wondering what I was doing wrong, or could be doing differently. The answer, I believe, is “nothing.” Besides the sale I held for FACE TIME, my only contemporary romance so far, in July, my sales have always been low. I participated in the Nebula Nights Box Set with several other awesome scifi romance authors. This made REMOVED available to a whole host of new readers. I made the entirety of REMOVED available on Wattpad, and Wattpad featured it which got me and my work great exposure. I ran a huge sale in August right at the same time as these two previous events were happening. I made REMOVED free for a short time (it was downloaded over 2500 times), RELEASED was 99¢, and REUNITED (a brand-new release on Aug 14) was $2.99. Since the discounted prices ended on August 20, sales have continued. I attribute this steady stream to people reading the Nebula Nights box set (which has been selling well since it was published) and the free download of REMOVED. I’m able to track the links at the end of my books and see that people click to download the next book in the series. I get a few hits from these per week! It’s quite a change from March when I sold a total of 10 books. Ugh. March was a depressing month. I am still imploring, begging, everyone who reads my books to leave reviews. It’s my policy not to really read them. Some times I skim them, especially if they are 3 stars and up, because I can blurb those for blog posts or promotional tweets. But otherwise I am forcing myself to look at the number of reviews and overall star rating, and that’s it. I have had some really fantastic reviews. I have had some middling reviews that either confirmed what I already knew about the book (and it was what I intended to do but rubbed the reviewer the wrong way), and I have had some real nasty reviews. Trust me. Even those bad reviews can sometimes help sell a book, so I just grin and bear it after a good sulk. 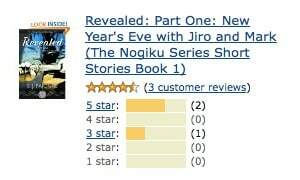 The first Nogiku Short stories definitely need more reads and reviews! I’d love to see all of these numbers on Amazon double in the next year. I wish there was some way to get even more reviews, but, short of totally unethical means, there is not, so I’ll just continue to keep my fingers crossed. People, do you have any idea how hard it is to write books with your fingers crossed? Goodreads is an entirely other beast all its own. I get reviews there and I refuse to look directly at them anymore. Some Amazon reviews can be harsh. Goodreads reviews go way beyond that. I have even stopped using Goodreads to catalog my leisure reading. Now I just mark books I’ve read on Goodreads and walk away. I only spend time there to leave a review if I’ve received an ARC of something and the author would like to blurb me. Here are my current stats on all my books there. Still respectable, so I’ll call it a win. I started this very blog back when I was writing the Nogiku Series first drafts. I had little-to-no following or readership, but it was good for me to practice blogging after a long hiatus (I used to have a knit blog but it has since gone away). In the past year, I have worked hard to provide original content for the blog and also use it to support other authors. Here’s a look at my blog stats from the past year. It’s nice to see that graph steadily increase over the year! I’m pleased with over 20,000 page views in the last year, and an average session duration of 01:23. That’s pretty sticky for the amount of content I offer. The big spikes on the graph correlate to some events I’ve participated in the last year including the Science Fiction Romance Brigade’s Mid-Summer Blog Hop and the Summer Reads Scavenger Hunt. I also had spikes during my release days for each book, and then a huge spike for the post I wrote on Facebook Engagement (which is kinda obsolete now as most of the tips on there are don’t work anymore). My goal with the blog this year is to continue to provide original content, news on my work and writing progress, and help out other authors with release day posts and blog tours. I’m cutting way back on cover reveals because they were becoming too numerous, and I’m taking a harder look at everything that I put here. Is the content valuable? Does it give back to the community? If not, I’m not going to bother. That Top Ten Romantic Japanese Manga post is surely a hit, and I got wise to it after some time and made sure to link to REMOVED on Wattpad from the article. 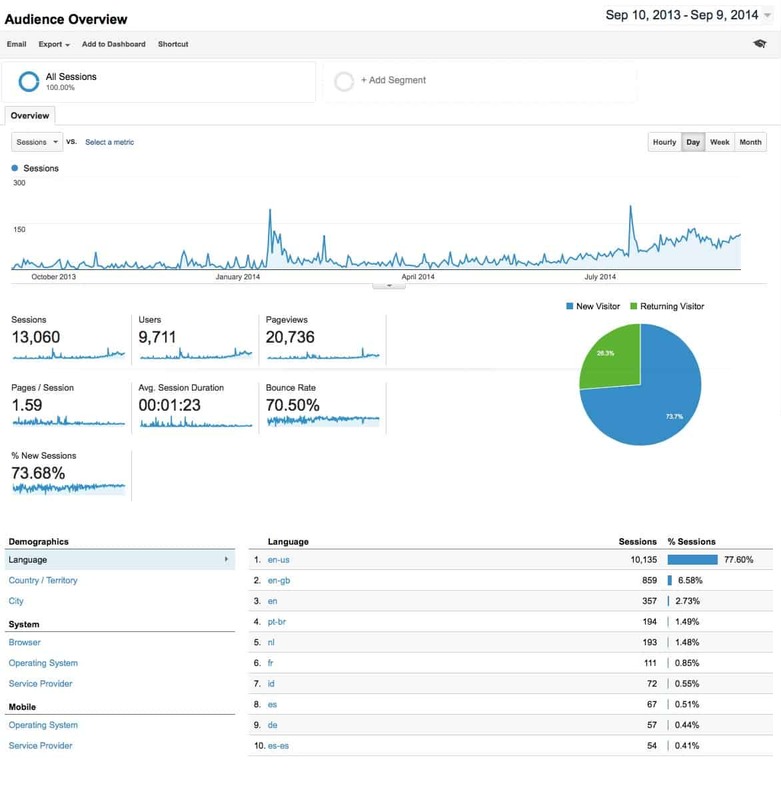 According to my stats, I get a few clicks on that per week and hopefully those people have read and become fans. I’m on most of the social media platforms but I concentrate all of my efforts on my blog, Facebook, and Twitter. Instagram I consider a personal pursuit because, although I do post book related things there, I use it to document everyday life, and my goal for next year is to use Pinterest more for my work. No real stats here this year because I’m starting a new baseline on both of these. 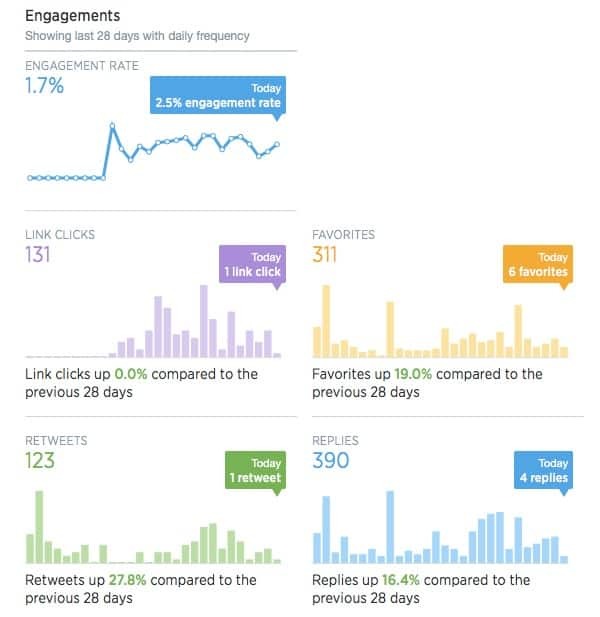 Twitter just announced that every user on Twitter can access analytics now. Here’s what my reach looks like now. I’m experimenting with some scheduled promotional tweets amongst my usual rambling. I think the two are working well with each other and I’m going to continue in this vein for the next year. Facebook has been such a pain. I got a slew of fake people from the Philippines who liked my page during a recent ad campaign, so I had to go in and clear out about 1000 fake profiles. Plus I took the time to clear out all the people who only liked my page during a rafflecopter giveaway. I went from 2028 Likes down to 1013 in one day. It was worth it though. I’m hoping that I can gain real followers and people who want to hear from me. Here are my stats on Likes, Comments, and Shares for the past year, and this is the graph I hope to see climb the most in the next year. Higher numbers mean that more people are engaged and my organic reach goes further. Here are the stats for my books’ rankings over the past year. I took screenshots of dips in rankings. For those uninitiated, the lower the sales rank, the better. The closer you get to being #1 in the Kindle Store, the better your book and author rank are doing. I’m not a best seller by ANY definition but I enjoyed seeing my books hit some popular lists. August 9, 2014, it dropped low in the Kindle Free Store during the free promotion I did. June 4, 2014, This is the best day REMOVED ever had as a paid book at 99¢. RELEASED only made it down to #25,000 on its release day, and REUNITED made it down to around #19,000 around its release day. Not worth taking a screenshot of either. This post was getting hella long so I broke it up into two posts. 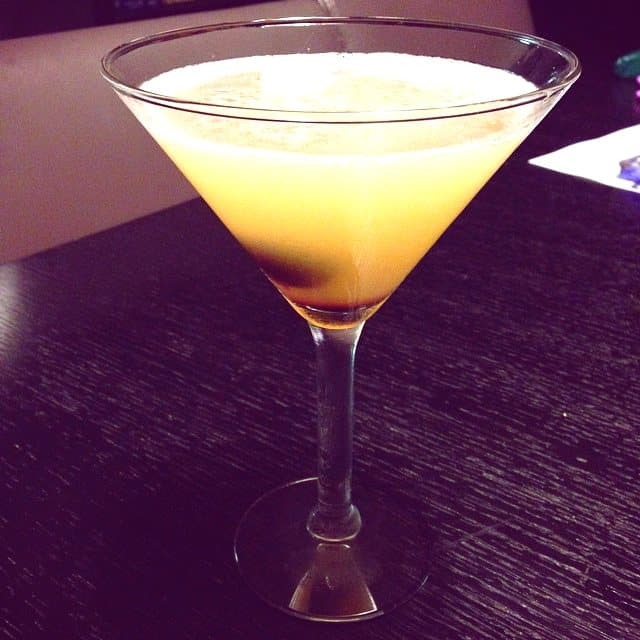 You can read Part Two, REFLECTIONS ON ONE YEAR IN PUBLISHING now!